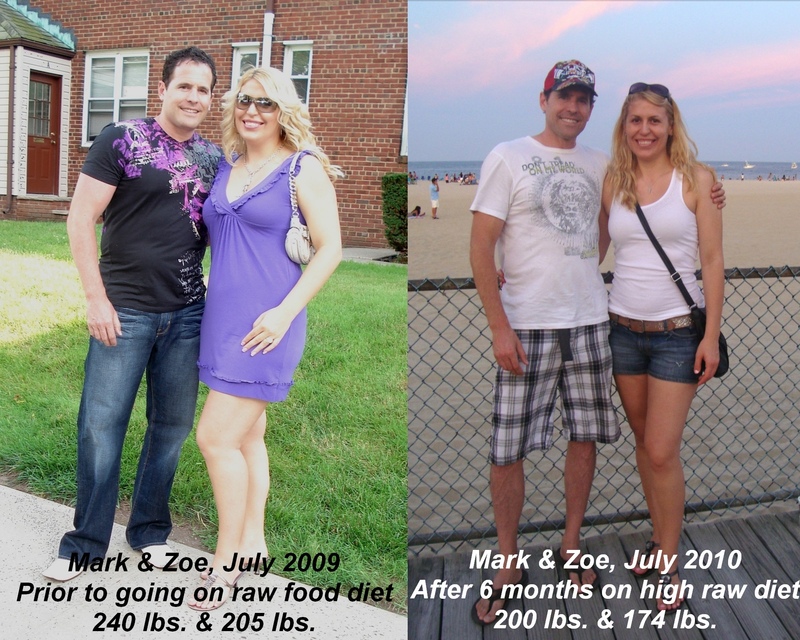 This month marks a special anniversary for Mark and I – our 6 months of being on the high raw diet. We started it in January as part of our New Year’s resolution, and while the original goal was to try it for a month, we managed to thrive and prosper for whole 6 months already. Unbelievable, I know! We’ve lost total of 70 lbs. between the two of us – he 40 lbs. and I 30 lbs. But the real proof lies in the “Before & After” pictures below. Take a look for yourself. What an extraordinary change. Look at us just a year ago – overweight, grumpy and tired. We ate the Standard American Diet (SAD) with mostly organic foods and minimal meat. No matter what we tried we couldn’t lose those extra pounds we accumulated as new parents. I gained staggering 55 lbs. during my pregnancy. About 25 lbs. came of after delivery and the rest stayed on my body reluctantly. It wasn’t until December when my mom purchased the Vitamix blender for me as my 30th birthday gift, that the weight started coming off. First, it was the Green Smoothies, then the Master Cleanse and then going completely raw vegan in January. Each phase helped me shed pound and eventually it stopped at 174 lbs. which I’ve been for good 3-4 months now. I feel fantastic! I’ve got so much energy and well-being. Given that all other factors in our lives are the same, our way of eating is the only thing that was drastically changed this year. Therefore, I contribute all the positive changes to the raw food diet we’ve been following faithfully for the last 6 months. 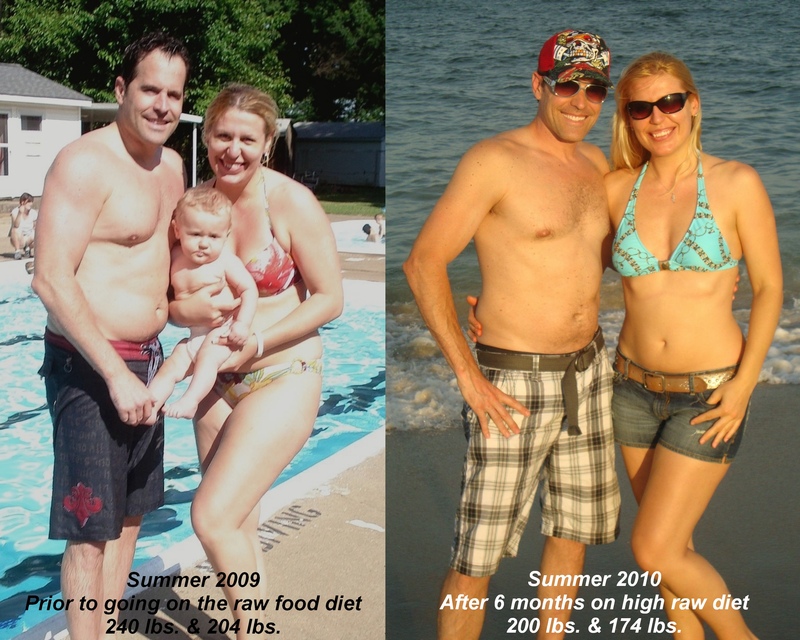 To hear more on my raw food journey and to watch me demonstrate live the physical transformation I’ve gone through, check out the two videos below. Seriously, you both look so fantastic and healthy! What an inspiration! Thank you for sharing!! This was so good! I really enjoyed all of this and you are getting me ready for my own transformation! Congrats to you, Mark and Denzin. Congrats to you both, you look amazing!!!! Wow! You guys look great! An example is worth so much more than words! You both must feel incredibly proud of yourselves! Spread the light! woo-hoo! Fabulous! You and Mark look fantastic! What an inspiration you both are! I love reading about your renewed health and raw food quest! I wish you continued success Zoe! Looking great! Congratulations! Have you had luck making coconut milk at home? I’d love to try some healthy elixir drinks. We’ve made kombucha, of course. It is located on my Green Smoothie blog toward the bottom, right on top of the video there should be a link. Wanting to know if any gallstones are released with this cleanse? What was your exercise regimen those six months?